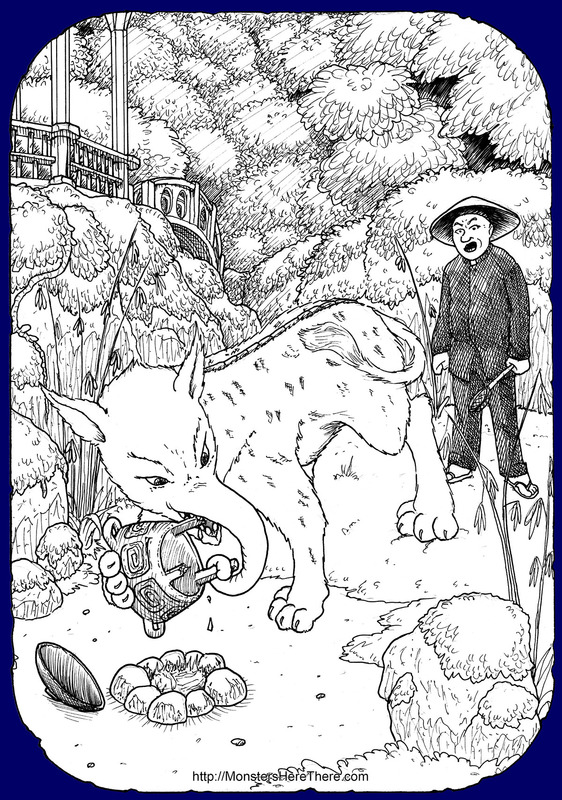 Ancient texts in China tell of a strange beast with rematkable toughness, whose name - 獏 - has been variously transliterated as “mo,” “mé,” or “mih” (we'll stick with 'mo'). This unusual creature had teeth strong enough to bite through iron, copper, and the joints of bamboo, and its stomach acids could easily dissolve these tough items. Mo were said to have lived in the areas of Sichuan and Guizhou (especially on Mount Emei in Guizhou), and sometimes ate tripods and cooking utensils if these were mistakenly left out by travelers. The mo was also believed to consume snakes and other reptiles. Its bones were said to be nearly solid, with very little space for marrow; and their teeth were strong enough that axes and knives could be broken trying to cut them; the teeth could not be destroyed by fire. Medicinally, the mo had many uses. The monster's urine was prescribed when a person had swallowed iron or copper, for it would quickly dissolve the metals in the victim’s stomach into harmless fluid... the hard part of this being, of course, first convincing the paitient to drink monster pee. In addition to using its urine to dissolve metal, rubbing the mo's feces on a knife would make it sharp enough to cut through gemstones! It is also said that the creature’s fat was good for treating swellings, but very hard to keep because it could seep through containers made of copper, iron, or pottery; so it could only be stored in a stone container. Sleeping on a mattress made from the pelt of a mo warded off diseases caused by bad air and dampness; infact, illustrations of the mo were said to have the same effect... for this reason, an illustration of a mo was often put on window shutters during the Tang dynasty [618 CE - 906 CE]. The earliest known mention of the mo in Chinese texts is in the ancient dictionary called the Er Ya (爾雅), published sometime in the 3rd Century BCE... about 2,200 years ago! Not much was said about the creature in the Er Ya, but later texts describe the mo in two ways. In many it is described as having a nose like an elephant, eyes like a rhinoceros, a tail like an ox, and paws like a tiger; in some other texts the mo is simply described as a bear. The mo was said to either have a spot pattern on its fur, or to have a distinctive coloration pattern of dark fur for its head and front legs, a wide stripe of white fur for its belly and back, and then dark fur for its hind legs and bottom. Strange to say, the mo was not the only animal believed to eat iron in China. A medical book compiled in 1578 CE, the Bencao Gangmu (本草綱目), tells of three other animals: the jiaotu, nietie, and an. The jiaotu is described as looking like a hare or large rabbit, and was said to live on or near Mount Kunwu, which was said to have a plentiful supply of red copper on its peak. A story is told that when the king of Wu [ca. 770-476 BCE] had no more weapons in his arsenal, his subordinates dug up two jiaotu, one male (yellow in color) and one female (white in color). The kidneys and gall in these creatures were lumps of iron, so the iron was cast into new swords... and these swords could cut through gemstones as easily as clay! The nietie -- whose name literally translates as “bite iron” -- was said to be seven feet tall, able to travel 68 miles (111 kilometers) in a day, and ate copper and iron. One of these beasts was said to have been presented to an emperor of the Tang dynasty [618 CE-907 CE]. There is also much the same tale told of nietie being used to make swords as told above of the jiaotu, except this incident was said to happen during the reign of Yu the Great [ca. 2200-2101 BCE]. In both cases, those would be some good swords to rediscover! The an was said to be a fierce black fox-like animal, seven feet long with a single horn on its head; as it got older, its fur was replaced by scales. Not only did it eat copper and iron, it also dined on leopards, tigers, and loong (Chinese “dragons"), so hunters were afraid of this beast. While the mo may have been a problem for the ancient Chinese, there are no modern reports of them and no apparent belief that they ever really existed. Most researchers came to the conclusion long ago ― at least as early as 1824 ― that the stories of the mo were actually based on known animals... the giant panda bear and the Malayan tapir. Both of these animals have similar dark-light-dark coloration to their fur as described for the mo, and both ranged in the same area of China that the mo was reported to live in. The reports of the mo as being a bear are almost certainly references to the giant panda bear of China, which has always been a rare and little known animal even in its homeland. While the panda bears are no longer equated directly with the earlier reports of the mo, it’s interesting to note that an American researcher in China in 1993 was told that panda urine could be used to dissolve swallowed needles, and that previous to 1949 it was still believed that sleeping on panda pelts would keep ghosts away and foretell if your day would be good or not (if you slept well, then your day would also go well). Both of these magical traits are obviously based on the much older beliefs regarding the mo. The Malayan tapir is likely the animal that the elephant-nosed mo was based on, because tapirs in general have a pig-like snout which could easily be imagined as a longer trunk; and the Malayan tapir in particular has the dark-light-dark coloration pattern described for the mo. As early as 1839, the fact that the Japanese monster called the “baku” has the same elephant-like snout as the Chinese mo was pointed out by many researchers. Also, similar to tales of the mo, it is said that a drawing of the baku can drive away evil spirits. It is now believed that the current idea of the Japanese baku was originally based on accounts of the mo that traveled to Japan in the 14th Century and mixed with some indigenous monster beliefs. So, even though the mo is no longer told of in China, it may continue to survive in the folklore of Japan! “Cultural note on dreaming and dream study in the future,“ by Tadao Hori, in Sleep and Biological Rhythms, 2005, vol. 3, pgs. 49-55. Bencao Gangmu: Compendium of Materia Medica, Vol. 6, by Shizhen Li & Xiwen Luo, 2003 Foreign Languages Press, first English translation of original ca. 1578 CE printing. ISBN: 7119032607, 9787119032603. pgs. 4013-4014. “Giant Panda,” article in Wikipedia website, 2011. Online: Click here! The Last Panda, by George B. Schaller, 1993 University of Chicago Press, Chicago, Illinois, USA. ISBN: 0-226-73628-8. pgs. 61-62. “Notices of Natural History: 1, the mih or tapir,“ in The Chinese Repository, Vol. 7, May 1838, pgs. 44-48. Online: Click here! “Sankai Ibutsu: An Early Seventeenth-Century Japanese Illustrated Manuscript,” by Masako Nakagawa, in Sino-Japanese Studies, May 1999, Vol. 11, Issue 2, pgs. 24-38. Online: Click here! “Second Species of South American Tapir,” in Magazine of Natural History, Vol. 5, 1832, pgs. 458-466. "Sur le Tapir de la Chine," by Abel-Remusat, article in Journal Asiatique, March 1824, France. pgs. 161-165. Online: Click here!